"The National Union for Social Justice: Preamble and Sixteen Points." "Share the Profits with Labor"
Father Coughlin's Weekly Letter: Stand By! 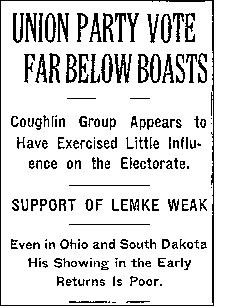 In August of 1936, Father Coughlin promised that if he could not secure at least nine million votes for the Union Party candidate, William Lemke, then he would retire from radio forever. With the landslide victory for Roosevelt, the Union Party was resoundingly repudiated (it received less than one million votes) and the NUSJ was discredited as a political force. Bowing to the apparent verdict of the American public, Father Coughlin announced his retirement from radio during his November 7 broadcast. 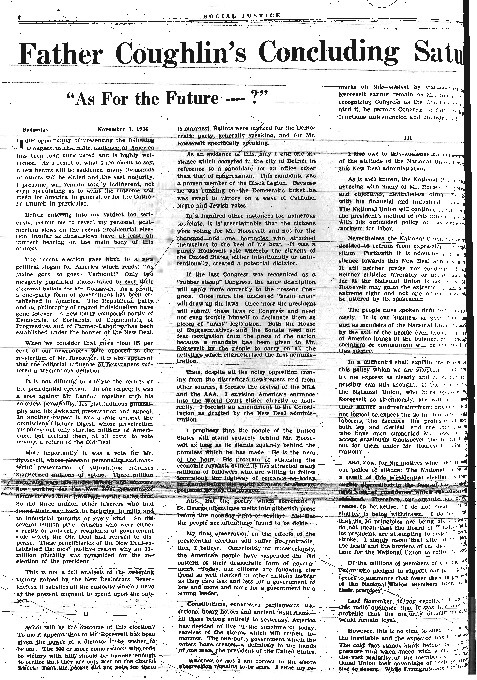 The document reproduced here is the text of his retirement address as printed in his own Social Justice newspaper. Coughlin claimed that his decision to go off-air and to suspend all NUSJ activities was the result of increased clerical and lay opposition, and not directly due to the Union Party's defeat at the polls. He charged that Father Ryan bore the greatest blame for the opposition, accusing Ryan of being a "paid spokesman of the New Deal." He also attacked Ryan as an inexpert economist, and alleged that Ryan's real influence for economic reform was negligible. Coughlin's retirement lasted only until January 24, 1937; he returned to the radio, he said, to honor the last request of his friend and defender, the Bishop of Detroit Michael Gallagher, who died on January 20. According to Coughlin, what form of government had the election created?